Yaffa Wigs is a high-end custom wig company based in Brooklyn, NY. The company sells both natural human hair wigs and synthetic ready-to-wear wigs designed by Yaffa. They wanted to display their merchandies online to reach a larger audience and Bitochon created a dynamic database driven web design that allows them to reach customers nationwide. 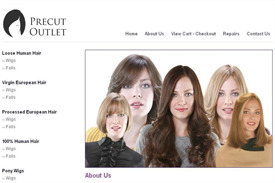 Customers can browse the site and find the designer wigs of their choice. The user interface makes it easy for any staff member to make changes in the site’s content and add or replace wig designs as needed.